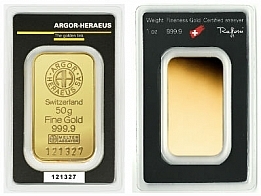 Argor Heraeus 1 Gram Gold Bullion Bar 999.9 Fine. The top of the bar features the Argor Heraeus logo, followed by the weight, fineness and serial number of the bar. 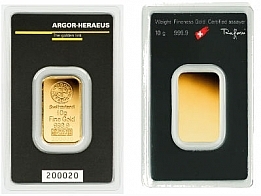 The 1 gram Argor Heraeus gold bar comes sealed in a certicard to prevent damage. Argor Heraeus is one of Switzerland's most prominent precious metals refineries, and their brand is recognised worldwide. 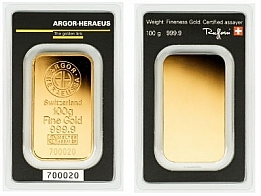 Argor Heraeus manufacture gold bars for bullion investors in sizes ranging from 1 gram to 1 kilogram. 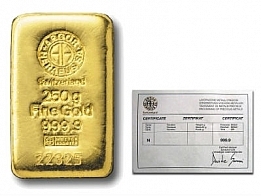 They also manufacture the Kinebar gold bar series, which is available in sizes from 1 gram to 100 grams. Argor Heraeus manufacture precious metals products for investors in gold, silver, platinum and palladium.